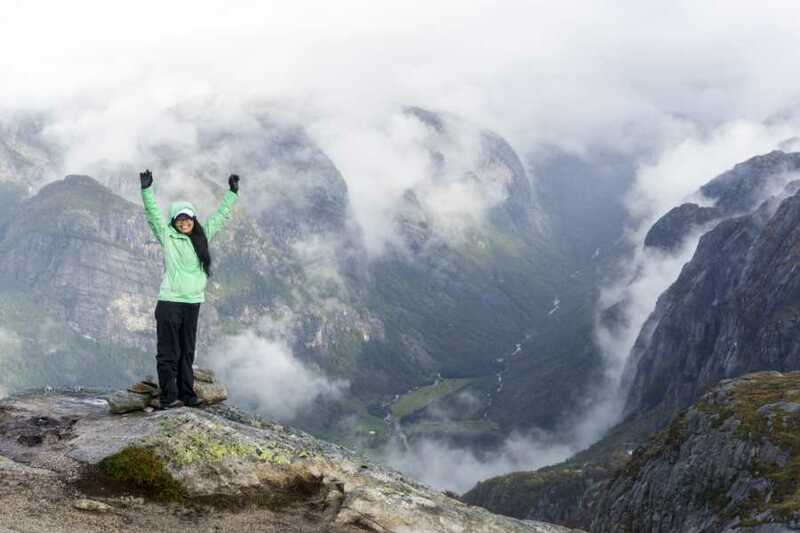 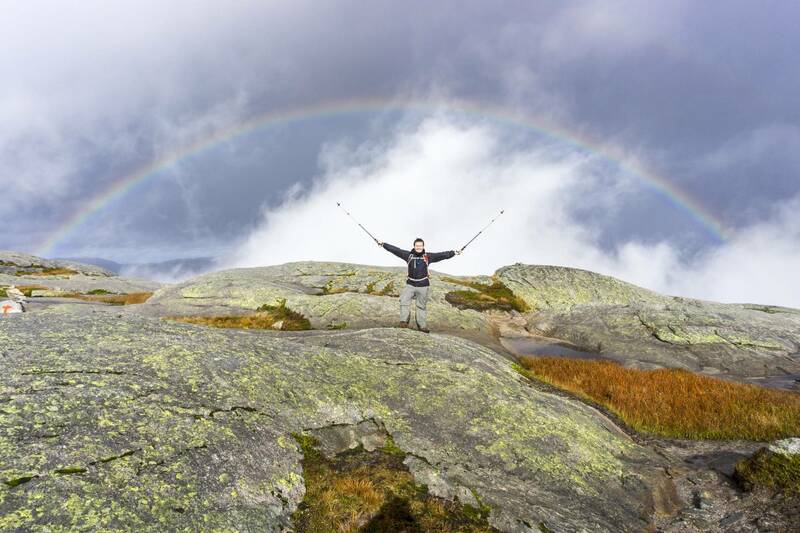 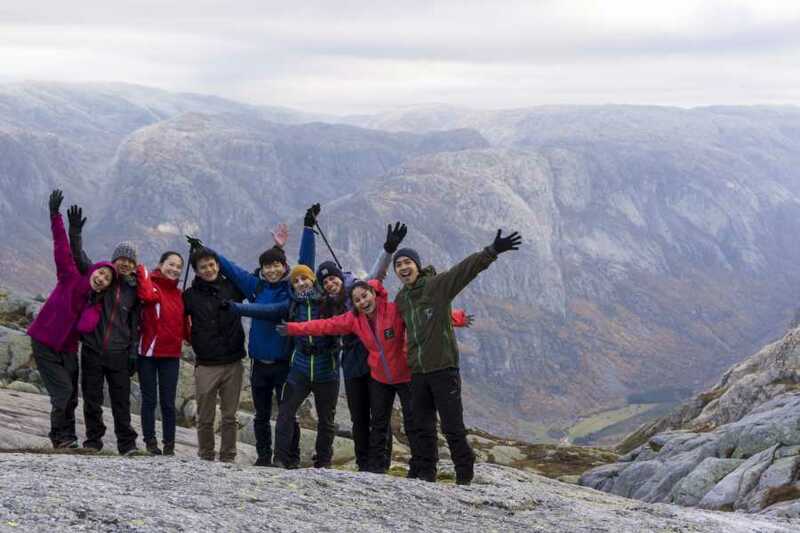 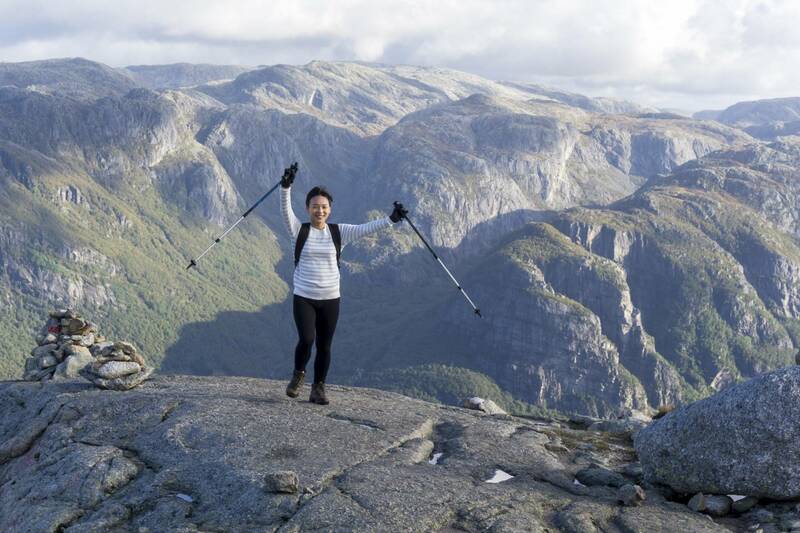 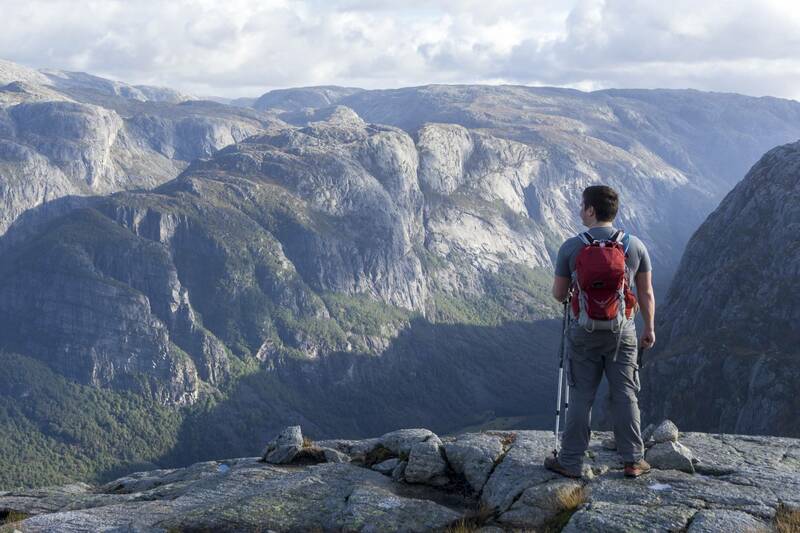 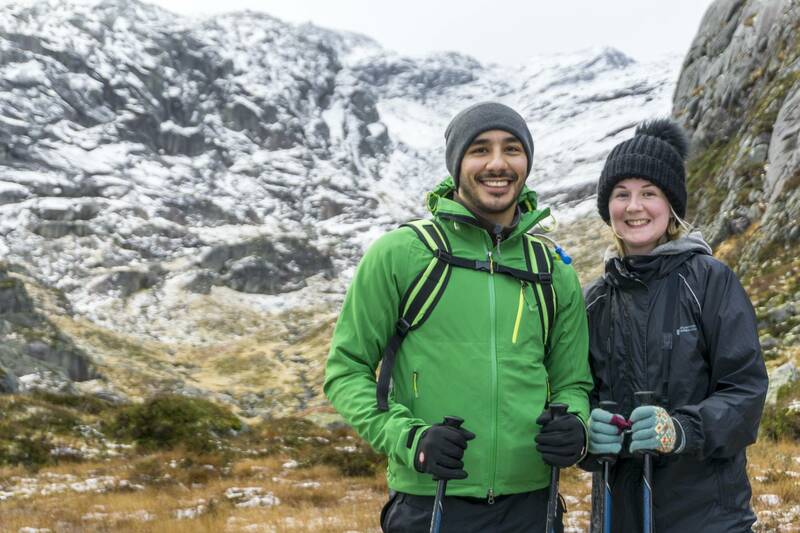 Join Outdoorlife Norway on an autumn hike to Kjerag, and witness the magic of the season’s shifting colors and Norway’s crisp and cool mountain air. 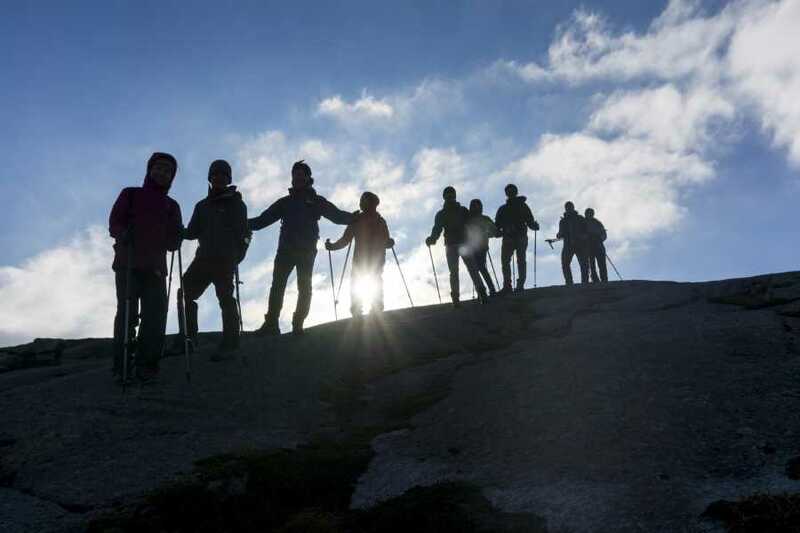 Hike on trails that have recently been upgraded by Nepalese Sherpas, who used local stones and made overcoming the final (and steepest) slope a little easier. 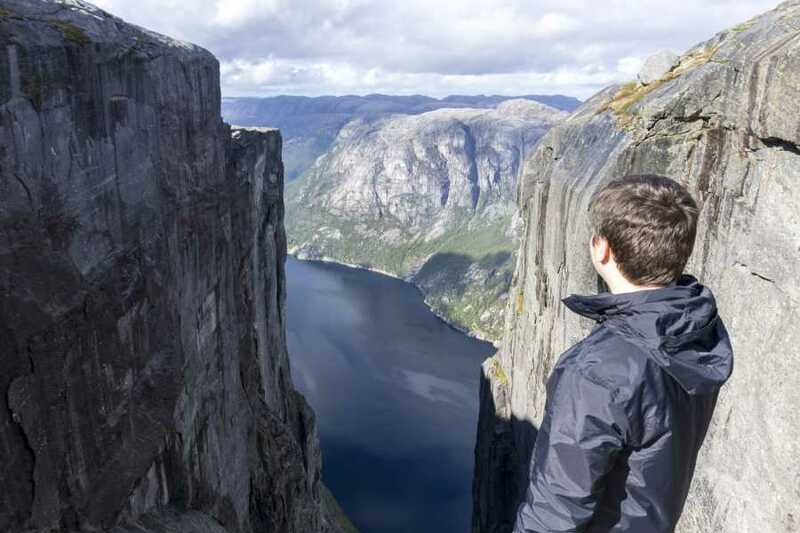 Though the hike to Kjerag is filled with breath-taking views of the Lysefjord, the trip’s highlight for many is standing atop Kjerag’s famous boulder. 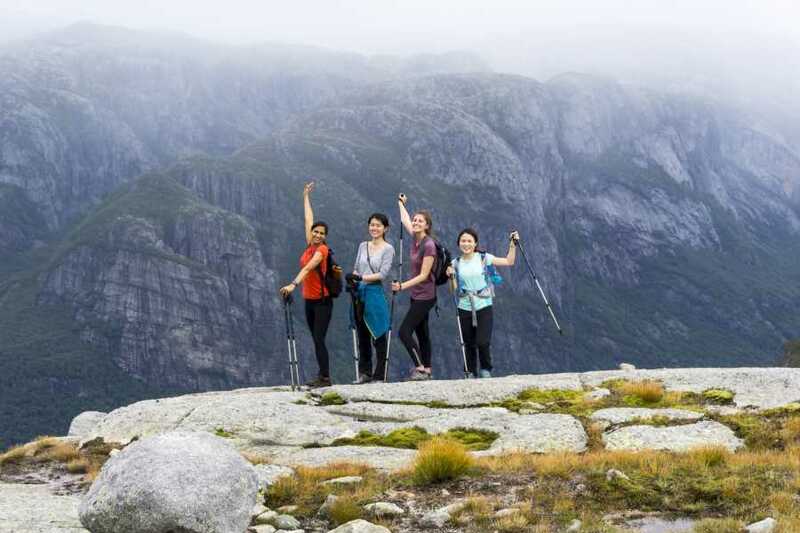 Your journey begins when your professional guide picks you up in Stavanger city-center (see above for specific pick-up times and locations). 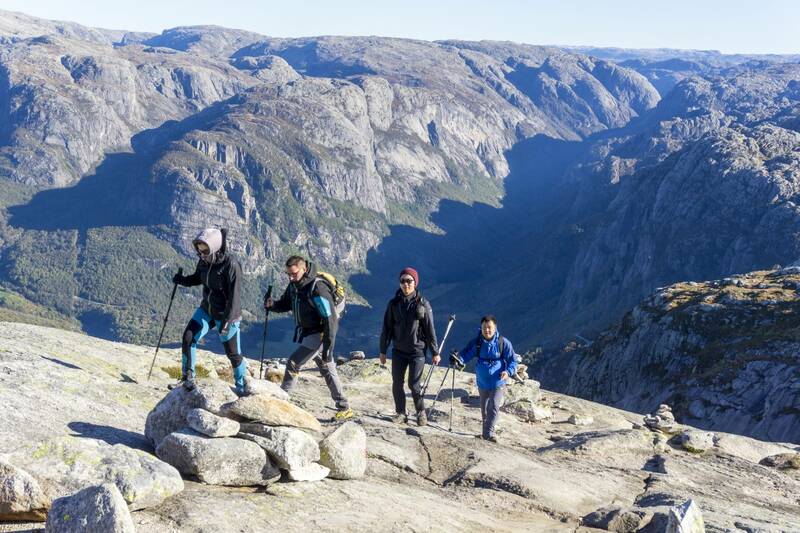 While being transported to the hiking trail, which takes about 2.5 hours, you’ll pass through a variety of dramatic landscapes including mountains, fjords, and bright green valleys. 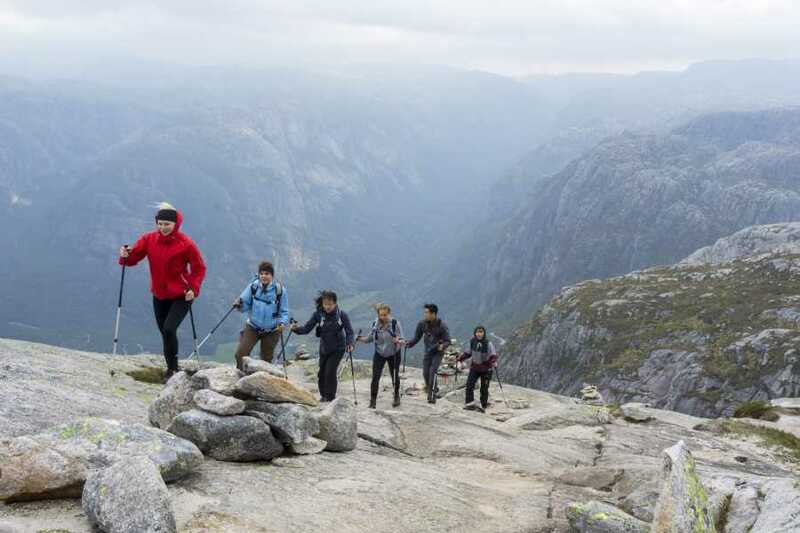 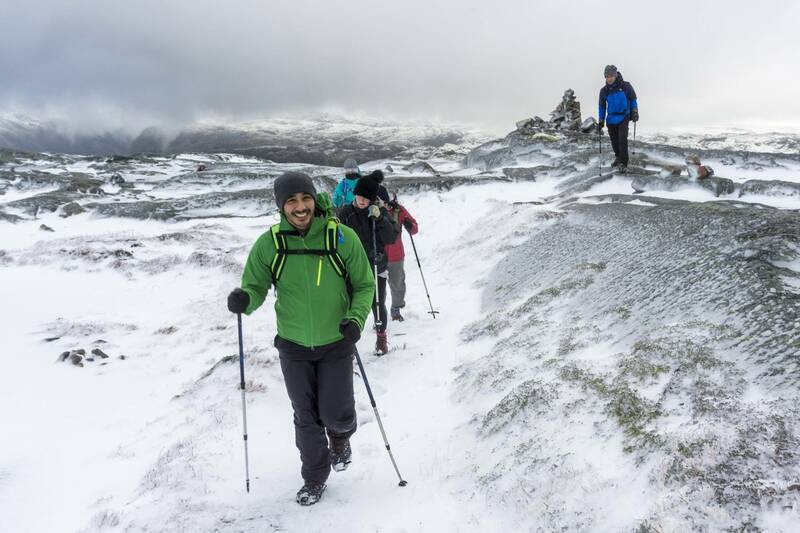 The guide will navigate over a mountain pass through the municipality of Sirdal. 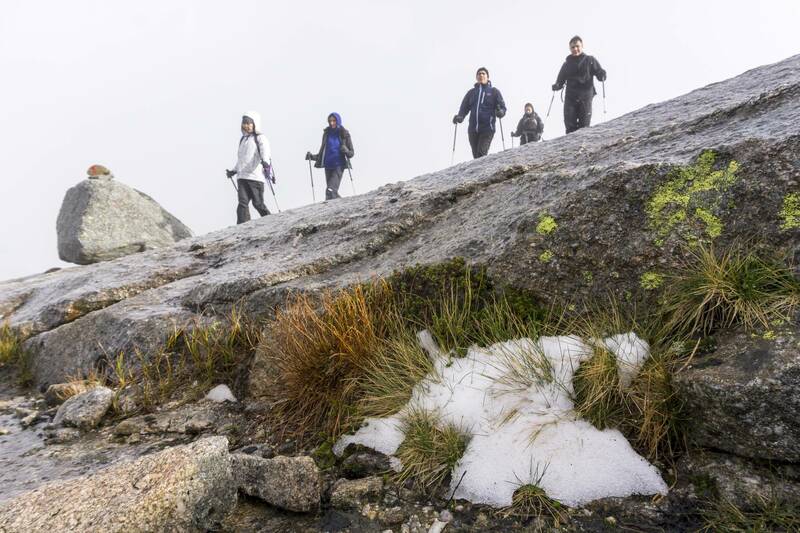 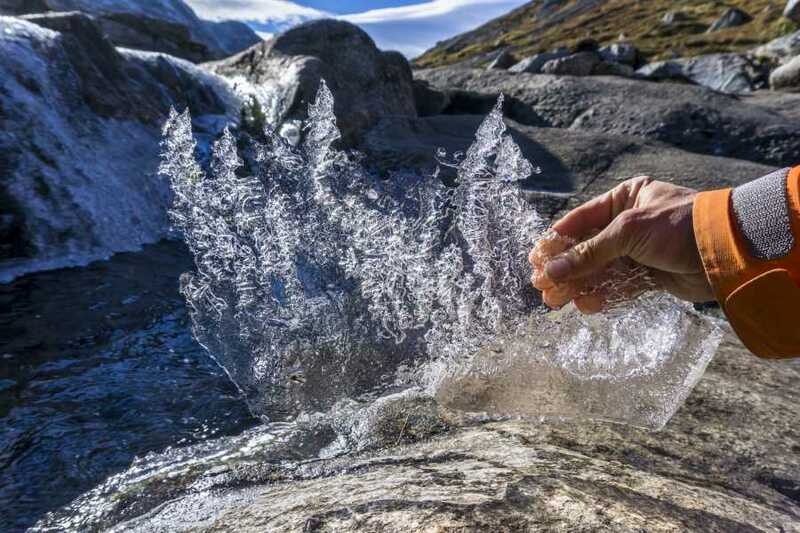 You’ll pass through a barren, glacier scoured landscape that many experience as being moon-like. 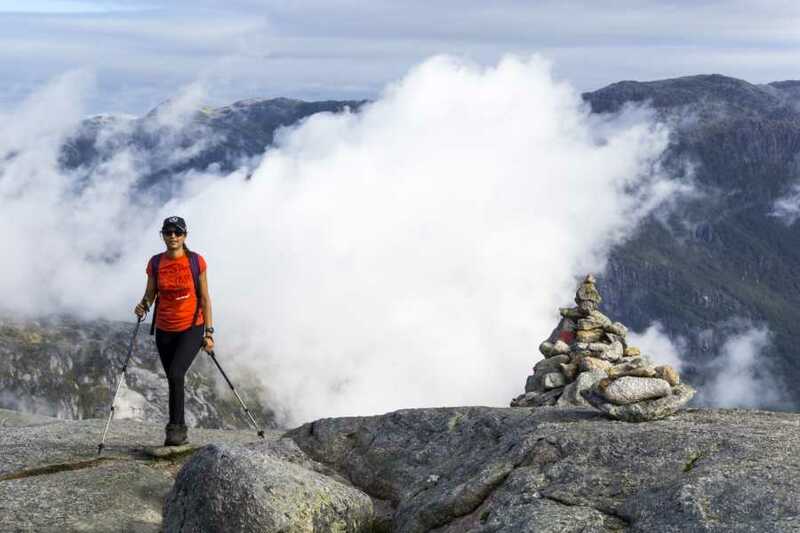 You’ll begin your hike at a trail-head that’s known as the Eagle’s Nest – which one can speculate got its name because it sits a lofty 640 meters above sea level. During Autumn, weather conditions can be unstable. 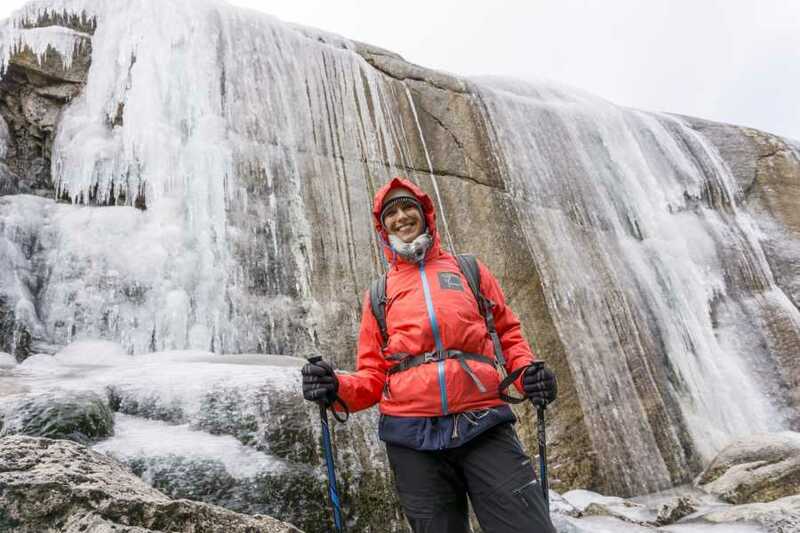 As needed, the guide will adjust your equipment (ice spikes, etc.) 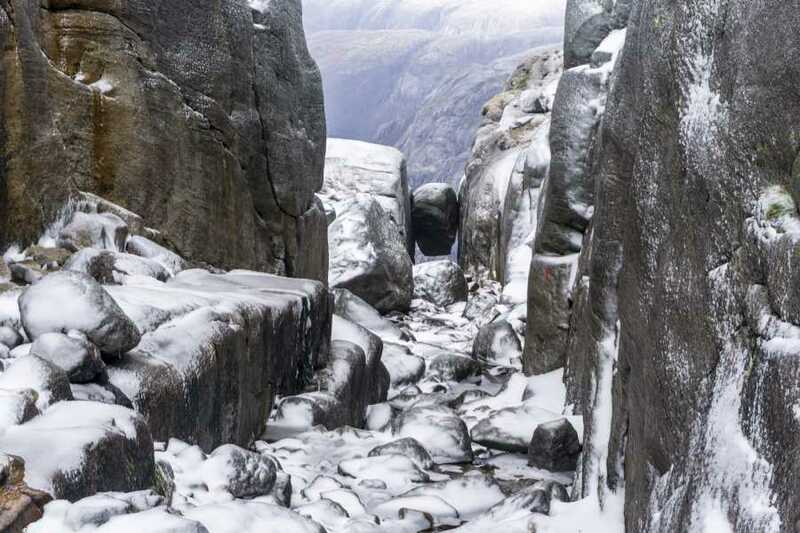 to match the weather conditions. 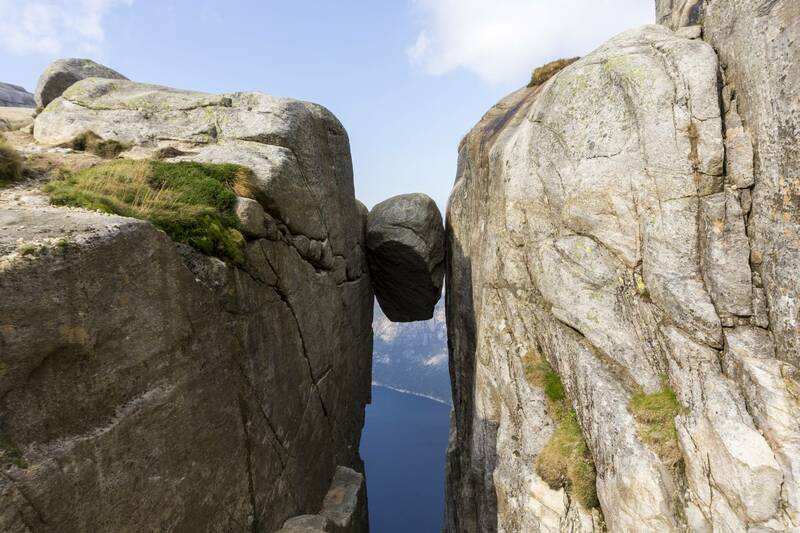 The hike to Kjerag is relatively demanding: you’ll trek 11 kilometers (round-trip) with an ascent of 800 meters in 5.5 kilometer. 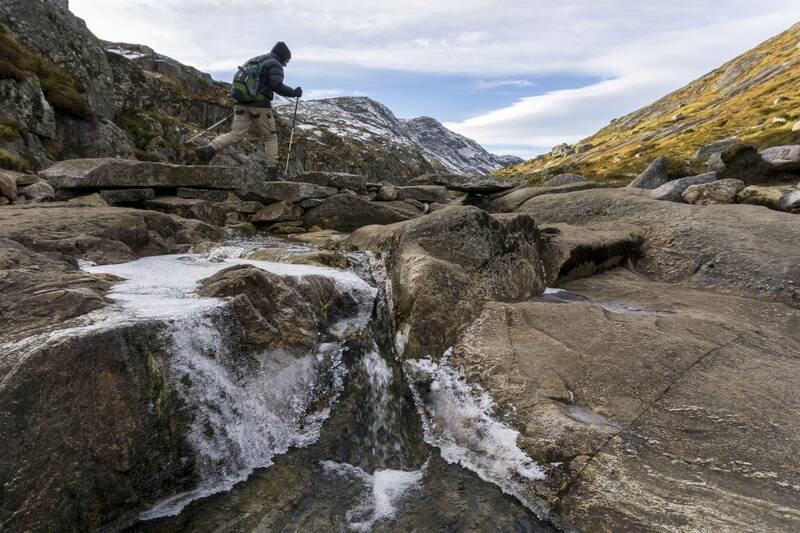 During the 2.5-hour hike to the boulder, you’ll encounter 3 periods of steep climbing interspersed with 2 shallow valleys. 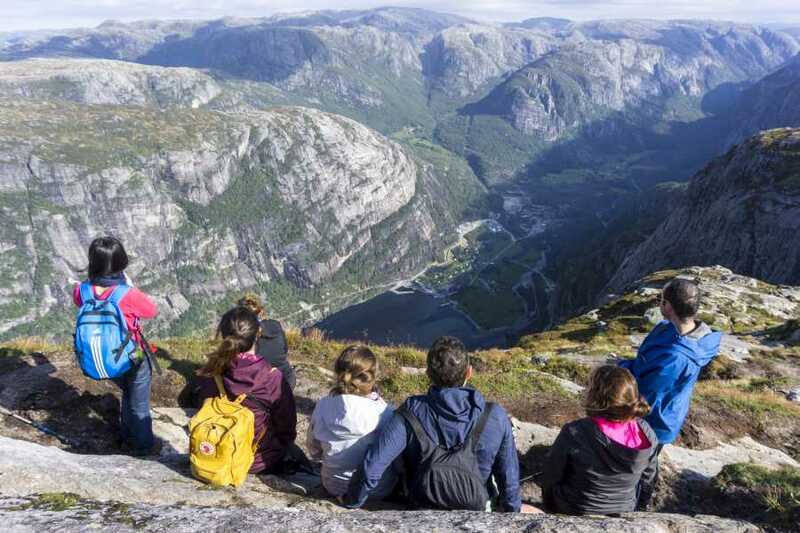 Along the way, you’ll enjoy views of the village of Lysebotn, which is situated at the head of the Lysefjord. 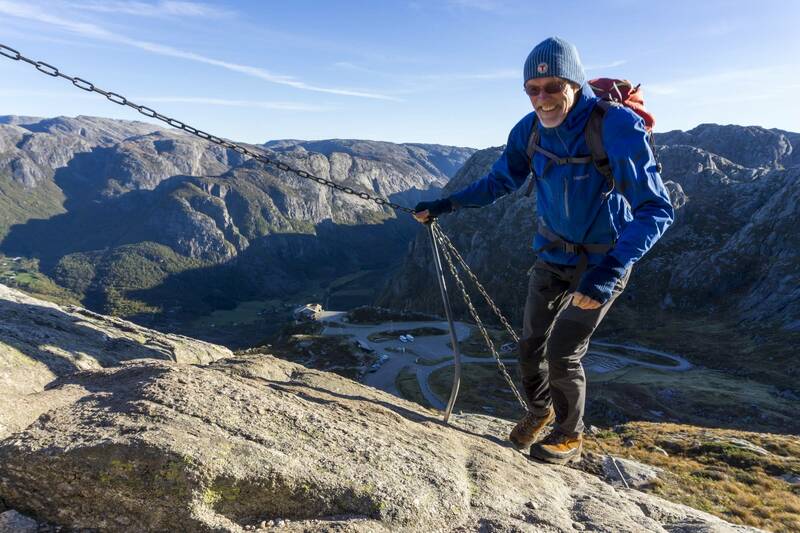 The final 2 kilometers leading up to the Kjerag boulder are relatively flat and will allow you to focus more on Norway’s beautiful wilderness. 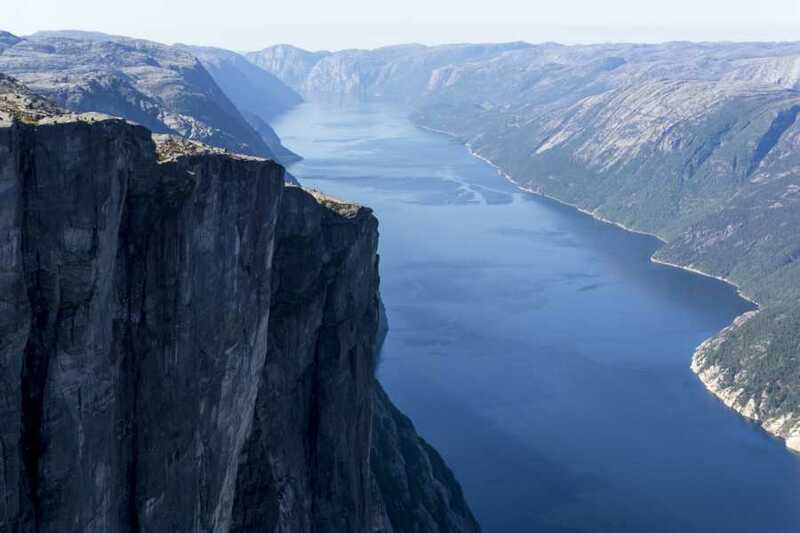 Once you reach the edge of the mountain’s plateau, while standing on a 1000-meter-high cliff, you will be rewarded with panoramic views of the 42-kilometer-long Lysefjord. 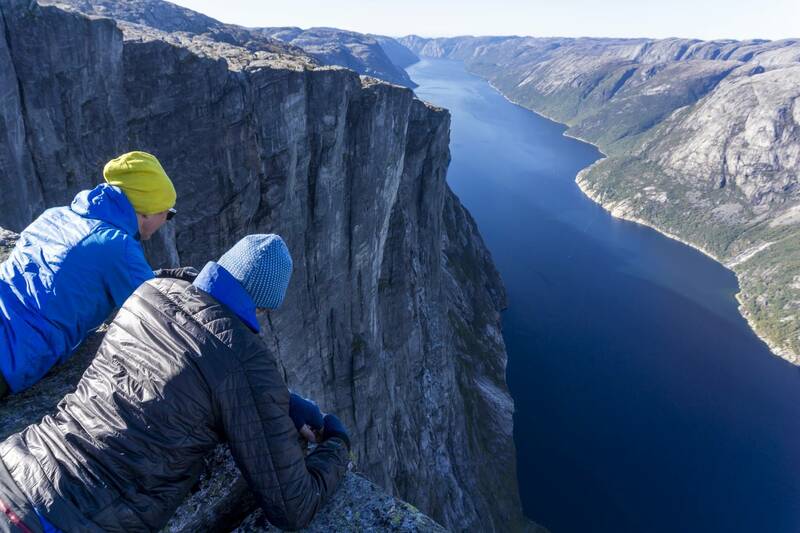 Cliff-side, you’ll have plenty of time to rest and enjoy your packed lunch. 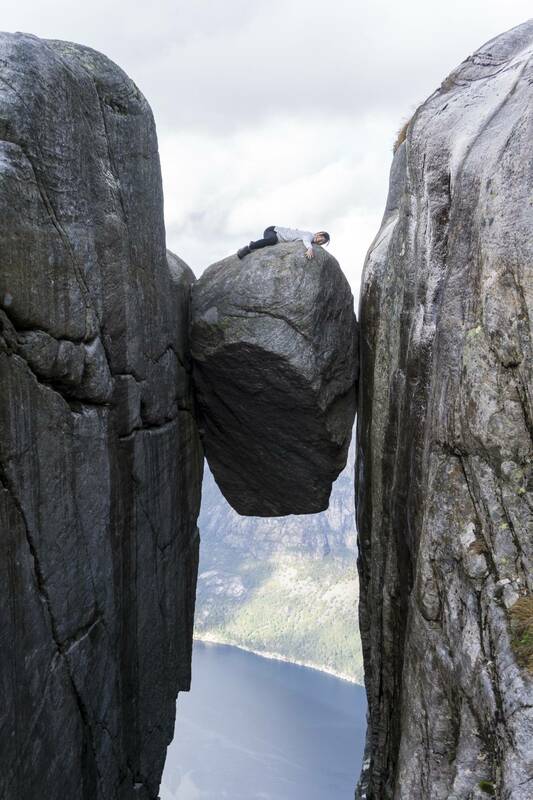 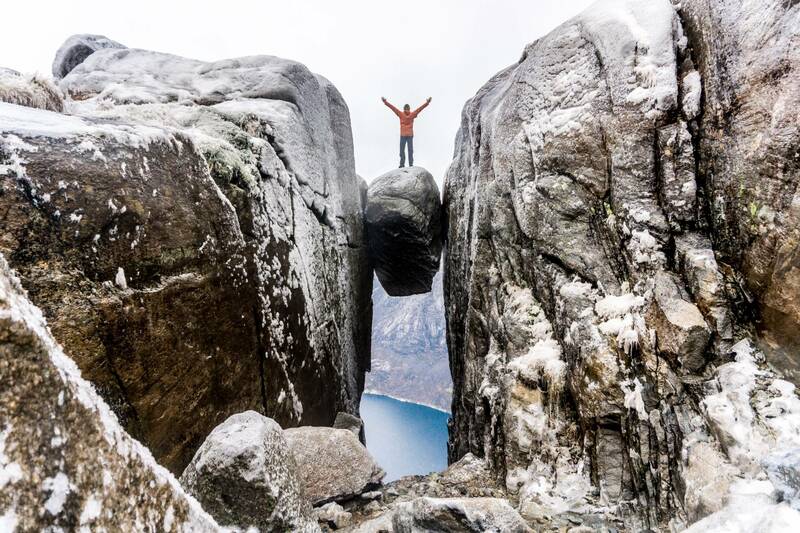 If you’re among the brave, you’ll have the opportunity to stand atop the Kjerag boulder. 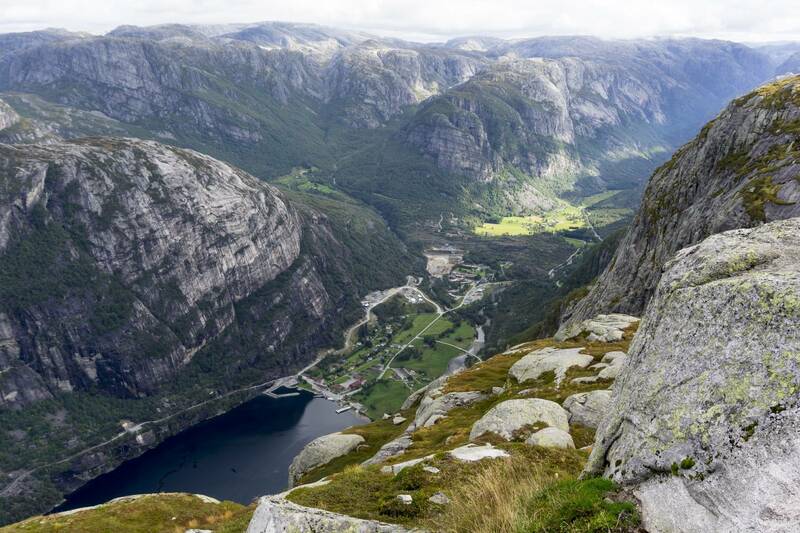 After the lunch break, your guide will lead you back down to the Eagle’s Nest, which takes about 2 hours. 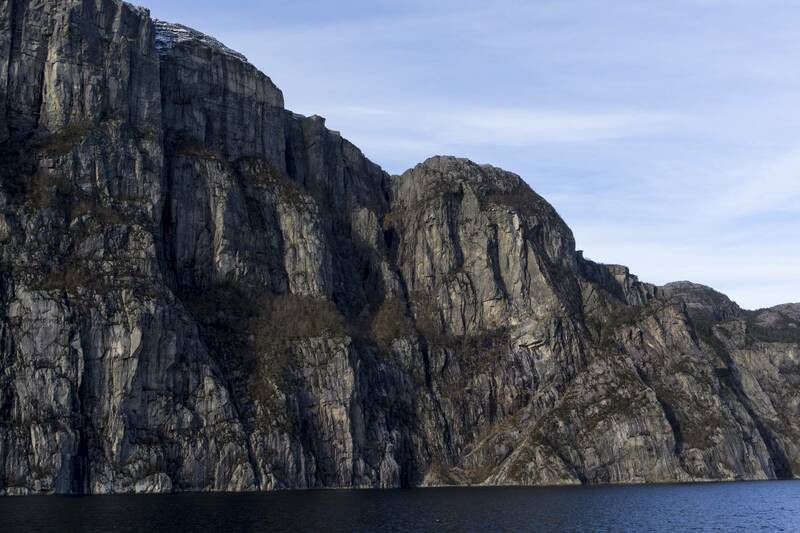 The ferry will set-off navigating under steep mountain walls towering hundreds of meters above the fjord. 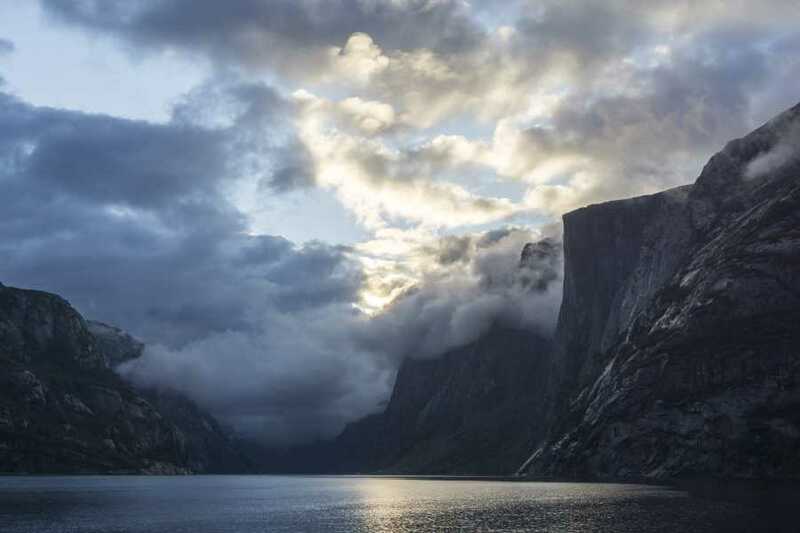 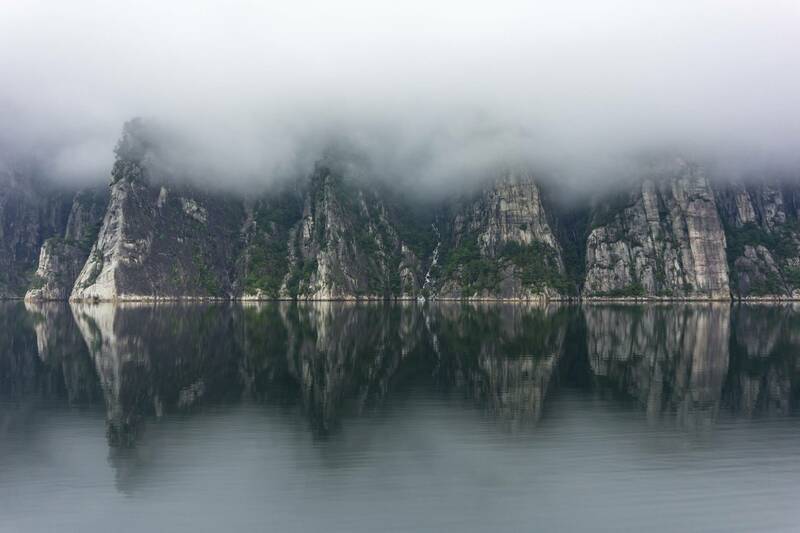 The cruise will transport you further out the Lysefjord where you will pass waterfalls, abandoned farms, and the famous Preikestolen cliff, which towers 604 meters above sea-level. 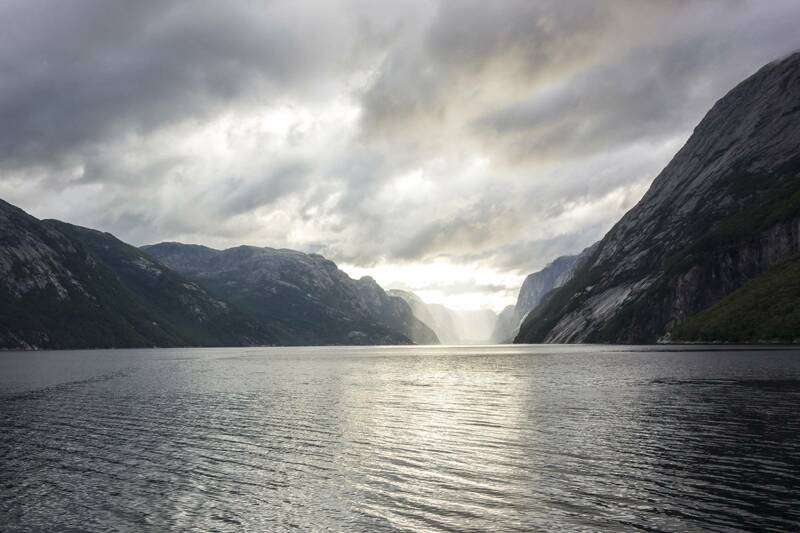 *On Saturdays, and between Oct 15 – 19, the speed ferry does not run and we will drive around the mountains. 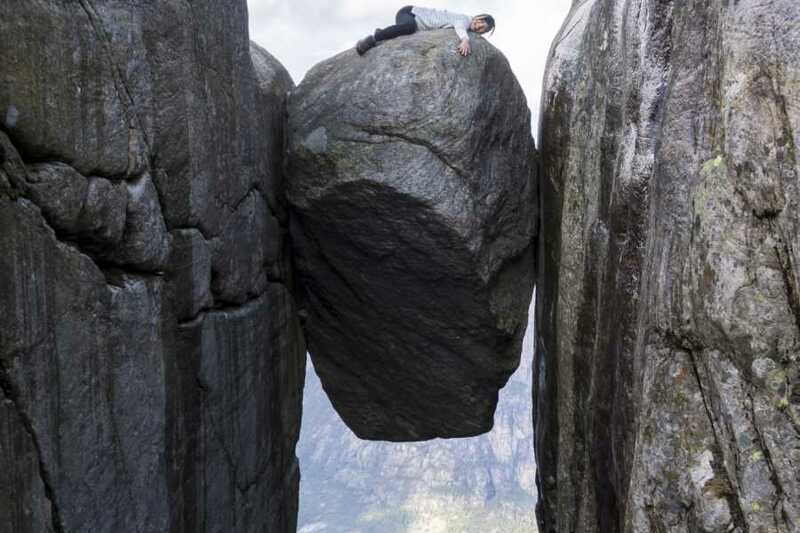 *This is an approximation which depends highly weather and other factors. 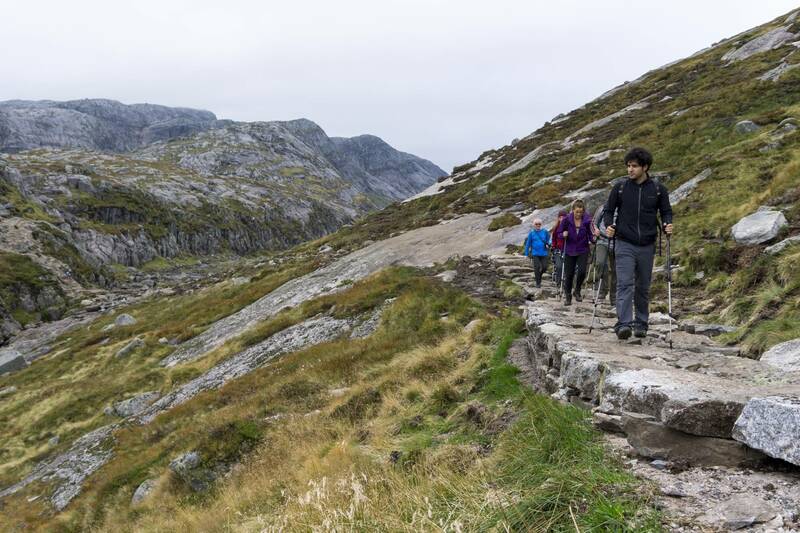 Transportation from Stavanger to start of the hike. 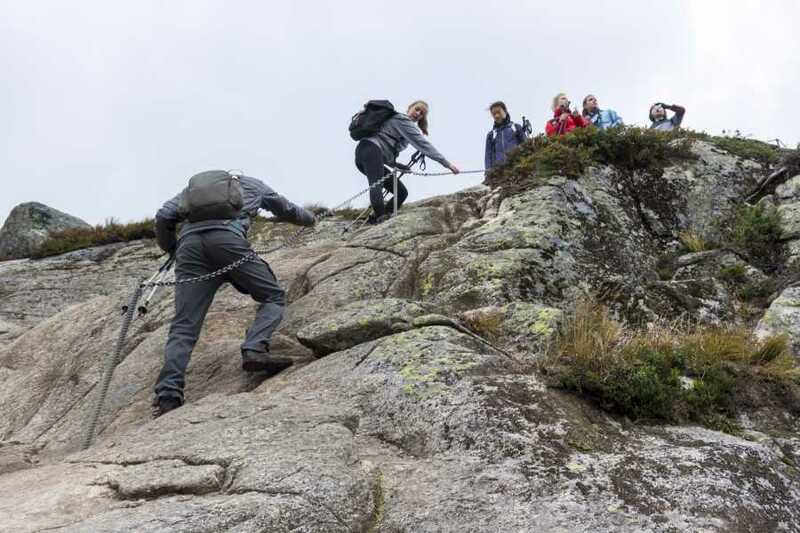 Guide with navigation, safety and emergency equipment. 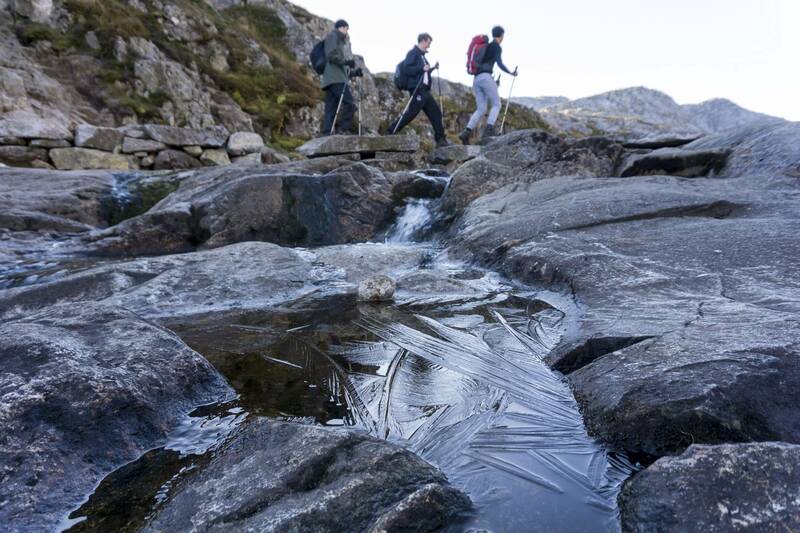 Hot beverages and snack during the hike.